Showing 19 articles from July 2, 2014. The Toledo School Board has chosen to hire local resident Angela Bacon as the next Toledo Elementary School (TES) principal after outgoing principal Lisa Hull resigned last month to pursue a career with the Mary M. Knight School District. Assuming the position July 1, Bacon had previously worked for Toledo between 2006 and 2009, during which time she helped form Toledo High School’s alternative learning program, and since 2011 had been serving as principal at Castle Rock Elementary School. For the second year in a row, a group of Vader families have organized a community Fourth of July celebration, with several more events this year, and a lot more fireworks. Scheduled to begin Friday afternoon in front of the Post Office, this year will feature a parade, kids’ games, live entertainment, and fireworks to be set off at dusk. Here’s hoping everyone is getting all decked out for Ryderwood’s Annual 4th of July “shindig”, making for a fun time for family and visitors from Vader and beyond. The Parade starts at 10:30 a.m. and will end at the Park in time for the VFW BBQ and Potluck Picnic at noon. The hot foods (big burgers, grilled onions, jumbo hot dogs, chili, baked beans) served by the VFW will include all the toppings and a beverage for $6. The Potluck is for side dishes, salads and desserts – no hot foods, please. Meanwhile, there will be music in the Gazebo (bring instruments if you wish) and a Pie Walk (pie donations requested) and games following the Picnic. Additionally, there will be an AED demonstration by the Fire Dept. Countdown to Cheese Days 2014, July 13-15. Schedule correction: Senior Center will NOT host their Baked Potato Bar this year. Second Saturday Pancake Breakfast will run as usual, along with the Second Time Around Sale. By the time you read this column, Toledo's Library will already have books on shelves Monday, ready for a sneak peek during Cheese Days. Timberland Regional Library will later install a kiosk for access to all their media. Are you coming to Vader for the Fourth of July? If not you’re missing out. There will be a parade, games, watermelon seed-spitting contest, vendors and more, all culminating in a grand fireworks display at dusk. This community-initiated program has grown rapidly since sprouting last year, and those who wish to learn more can contact event organizer Judy Costello at (360) 295-3036. For those who are unaware, the Vader Assembly of God hosts a food bank for the community every second and fourth Tuesday of the month, with the next open day coming up July 8. Open starting at 10 a.m., the food bank is among a number of outreach programs available for community members at the church, and those with questions may call (360) 295-3756.
vision:TOLEDO has installed a new sculpture at the corner of 3rd and Cowlitz. The steel steelhead fish was designed and constructed by Ron and Victoria Smith with bricks set in place by Di and Mike Morgan. The Toledo Community Library will have a “sneak-peek” opening and bake sale, Saturday during Cheese Days from 10a.m. to 3 p.m. Pat will be in the Library on Monday, June 30, and again on July 7 from 10 a.m. to 2 p.m. to accept used books. Well, I hear Egg Days went off with a smash! Nakisha Silverstri was crown Egg Day Queen. I have been looking forward to attending Egg Day and seeing everyone to catch up but unfortunately I ended up with an emergency. Talk about being bummed. I know the weather was not perfect but people from Winlock are tough nuts to crack. The Fire and Police Department spend days making their rigs shine so much you can see your reflection. Oh, now I have to wait another year. If you have stories you would like to share or ran in to someone you haven't seen in years, please tell me all about it! The Cowlitz Public Shooting Range has been given an extension on its building permit and is expected to be open again starting Saturday. The range, located just north of Castle Rock at the end of Toutle Park Rd., had been closed indefinitely June 10 after Cowlitz Game and Anglers, the club overseeing construction and use of the range, has been unable to meet a construction deadline of May 31 for Phaze II of the facility. The Winlock City Council is close to revamping their utility billing practices as the final anticipated changes to Ordinance 954 were approved during their June 23 meeting, while updates to the city’s billing software were also discussed. Begun in February as part of efforts to improve the city’s bottom line, increases in fees related to sewer/water hookups and late charges, as well as how late accounts are defined and penalized, have led to significant changes in Ors. 954, governing such fees. These most recent changes, supported unanimously by the council, are expected to be presented as an official ordinance during their next meeting, with no further changes expected at this time. A Toledo man has been cited after damaging a utility pole and fire hydrant near Centralia June 24. The 20-year-old driver of a 2005 Dodge Ram had been traveling on the 3700 block of Cooks Hill Rd., west of Centralia, when he failed to negotiate a curve and drove off the roadway, shearing a utility pole and fire hydrant from their mountings. Authorities are seeking help solving a malicious mischief occurring last month in Centralia. Sometime between 5 p.m. May 2 and 1 p.m. May 5, an unknown number of suspects entered an industrial building on the 2600 block of Airport Rd. and cut fencing, removed wires from a fuse box and sprayed graffiti on the walls. The estimated cost of damages is around $1,050. The Washington State Patrol is seeking additional witnesses to the car/semi-truck fatality collision occurring June 22 on I-5 near Milepost 46, south of Castle Rock. At approximately 4:04 a.m., Kerri Hartnett-McGill, of Edmonds, was traveling south on I-5 when she crossed into the northbound lanes and collided with a semi truck. High temperatures are believed to have caused a five-alarm fire in a storage building near Toledo July 2, according to local officials. Aid was called around 8:45 p.m. to the 100 block of Hopp Rd. N., east of Toledo, where responders found an outbuilding fully involved in flames and threatening other buildings nearby. 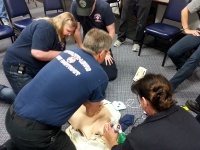 Firefighters from Toledo, Winlock, Napavine, Vader and Ryderwood attended a special High Density CPR training course June 25, instructed by paramedics from American Medical Response (AMR). Fire districts around the area have undertaken more intensive steps to improve the quality of their CPR services, as the technique has seen instances nation-wide of improved survival rates for cardiac patients. As wildfire season begins, members of Lewis County Fire District 2, based in Toledo, undertook a life wildland fire training event Saturday to bolster their already-strong response capabilities. Led by Captain Tracy Summers, who has been called upon as a strike team leader in events such as the recent Cottonwood 2 Fire June 17 in Yakima County, firefighters were shown how to contain and combat a wildfire, which ended up involving quite a bit more fire and elbow grease than water and fire suppressant. A local woman’s recovery from Sudden Cardiac Arrest after a husband’s endurance and swift CPR saved her life. Trash bins end up full of such items discarded in spite of their redeeming qualities, but these days a growing number of craftspeople are choosing to re-purpose and re-imagine what these items could be, including Vader residents Dianne and Elizabeth Gruginski.